President Jimmy Carter is known to be a deeply religious man and a devoted husband, father, and grandfather. Celebrating his 94th birthday this year, he continues to focus on the social issues that have preoccupied his time since leaving public office in the early 1980’s. In 1982, he and his wife, Rosalyn, established the Carter Foundation with the motto: “Waging Peace, Fighting Disease, Building Hope.” The foundation receives funding from governments, corporations, and private citizens to support human rights and healthcare initiatives around the world. During the 1940’s and 50’s, President Carter completed his education, served in the Navy, and started a family. His political career began after the death of his father, when he returned home to Georgia to manage the family’s farm. Carter was elected to the Georgia Senate in 1962, he became Governor in 1971, and he defeated Gerald Ford in 1976 to become the 39th president. While in office, President Carter set near-impossible goals for his administration, such as his determination to influence a peace process in the Middle East, and his attempts to negotiate the release of 52 Americans taken hostage when the US embassy in Tehran was attacked. In September of 1978, President Carter invited Egyptian President Anwar Sadat and the Israeli Prime Minister Menachem Begin to Camp David to talk in secret about the wars that have shaped the religious and political landscape of Israel for decades. President Carter urged the men to compromise. He tried to persuade President Sadat to de-escalate violence against Israeli citizens. He negotiated with Prime Minister Begin to re-draw the boundaries of settlements within Israel, returning land to the Palestinians that they’d been occupying in defiance of a ruling by the United Nations. The resulting Egypt-Israeli Peace Treaty of 1979 won Sadat and Begin a Nobel Peace Prize. Despite President Carter’s efforts, though, the violence continued. The UN wouldn’t send troops to stabilize the region, stating that they could only help enforce treaties that were negotiated by members of the Security Council and approved by the General Assembly. War raged on and ultimately led to the assassination of President Sadat two years later when he was gunned down by extremists who opposed his peace talks with Israel. When President Carter was elected in 1976, the US foreign policy with Iran included peaceful dealings with Shah Mohammad Reza Pahlavi, a relationship that protected American ships exporting oil through the Persian Gulf. But the Iranian Revolution erupted in 1979 and Pahlavi was overthrown. In place of a Shah, the Iranian government declared that Ayatollah Khomeini was to be the Supreme Leader of Iran. Pahlavi fled Iran and was allowed to travel to the United States where it was said he was receiving treatments for cancer. When Pahlavi refused to return to Iran to face trial, the Iranians considered the United States to be just as guilty as Pahlavi for the crimes he was being accused of. In retaliation, the US embassy in Tehran was attacked on November 4, 1979, and 66 Americans were taken hostage. Rescue attempts and economic sanctions against Iran were unsuccessful. A few of the hostages were freed as the others were continuously being moved to different locations, often being isolated from each other, living under harsh conditions, and denied medical treatment. Negotiations were set to continue as newly elected president Ronald Reagan took the oath of office in January 1981. After 444 days, and on President Carter’s last day as president, the 52 remaining hostages were freed. President Carter supported emerging technologies in energy conservation, adding the Department of Energy and the Department of Education to the executive cabinet. In 1977, he signed over the rights to the Panama Canal to the Panamanians after almost a century of US involvement in the region. And he authorized the use of federal funds in the restoration of the Love Canal site near Niagara Falls, NY. The Jimmy Carter Presidential Library is in Atlanta, Georgia, just minutes from the offices of the Carter Foundation. 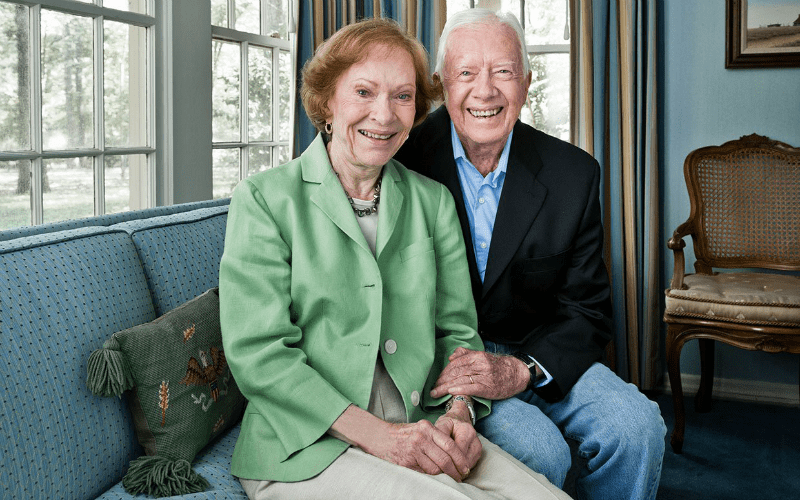 President Carter remains active within the Baptist church, and he and his wife Rosalynn celebrate their 72nd wedding anniversary this year.